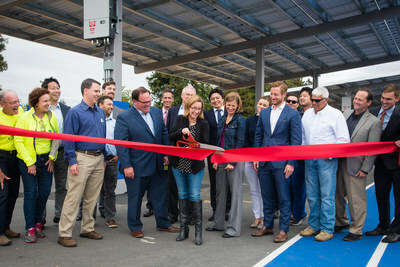 SAN FRANCISCO, May 24, 2018 /PRNewswire/ -- ForeFront Power and Los Altos School District (LASD) in California celebrated the completion of solar canopy systems across nine District schools today. The ceremony at Oak Avenue Elementary School also included Sunworks, the primary construction contractor, and TerraVerde Energy, the District's procurement consultant. The 1.4-megawatt (MW) portfolio is now delivering clean, renewable energy to the schools at a price below their grid rate. "The Los Altos School District has a history of financial prudence and commitment to providing top-notch education for every single one of our students. The completion of this project immediately begins a cost savings that will contribute to quality education in all of our schools," said Superintendent, Jeff Baier. "Not only were our projects successfully completed, but we also gained infrastructure for future electric vehicle charging and improved ADA compliance. The cost savings are crucial and a great benefit for our students and teachers," said LASD Chief Business Official Randy Kenyon. "The ForeFront Power team went above and beyond the original project scope." ForeFront Power included Data Acquisition Systems (DAS) that integrate with online system performance monitoring software and flat screen televisions that were installed in the front office of each school. All schools will also receive free solar energy lesson plans and curricula through ForeFront Power's exclusive partnership with Schools Power. These lesson plans promote a technical understanding of solar energy as well as career and college readiness training to prepare the next generation of leaders for solar jobs. "These projects highlight our desire to fully integrate solar energy into the learning environment at each school," said ForeFront Power Chief Strategy Officer, Daniel Taylor. "From shade on the playground to hands-on activities in the classroom, we hope students will understand the myriad impacts of on-site solar energy."